LIBERTYAIR is your one stop for everything related to heating and cooling. We offer professional installation, maintenance and repairs for electric heat pumps in Gainesville and the surrounding North Central Florida region. If you have a heat pump emergency, call us at 352.333.1985. We offer fast and reliable emergency heating repairs, and we never charge for overtime. Problem with your heat pump? Call us today! Heat pumps are a popular way to heat your home in North Central Florida. While heat pumps are not as effective in very cold climates, the mild winters we experience are no trouble for electric heat pumps, even in North Florida. At LIBERTYAIR, our heat pump technicians are experienced in the installation, maintenance and repair of many of the top­of­the­line, name-brand models. If you need a new heat pump installed, if it’s time to schedule planned maintenance on your heat pump, or if you’re experiencing a problem with your heat pump, call us to schedule an appointment. Although the name suggests otherwise, heat pumps can actually heat and cool your home. These heating systems, also known as heat­transfer pumps, pull air from your home and pump new air into your home. In the summer, heat pumps pull warm air from your home and push it outside. In the winter, heat pumps pull air from outside, warm it using either a water­based system or a refrigerant­based system, then push the warmed air into your home. Heat pumps are very efficient. In fact, they can be up to 4 times more efficient than electric furnaces due to the way they move air around your home. Heat pumps can be used in conjunction with an air conditioner or a central heating and cooling system for more effective cooling. Once the heat pump removes the warm air in your home, your air conditioner can cool your home more quickly, using less energy. Heat pumps can utilize your home’s existing ducts, but they can also be used in ductless residences, making them more versatile than other heating system options. However, even ductless heat pumps require regular maintenance. Because heat pumps can run all year long, we recommend having them checked at least twice a year, in spring and autumn, when they are not being used to full capacity. Having your heat pump inspected, cleaned and maintained can extend its lifespan and improve efficiency and effectiveness of the heating system. We also provide duct cleaning maintenance so your home’s air remains clean and safe. If you’re experiencing problems with your heat pump, our repair technicians can investigate any issue, accurately diagnose the trouble, and provide you with a plan of action. In most cases, we can provide quality heat pump repairs. However, because the lifespan of heat pump is only approximately 15 years, a heat pump replacement by one of our technicians may be required. Heat pump won’t run.This is a common issue that can have a few causes. First, check that your thermostat is working properly. Then, make sure that your heat pump is receiving power. A circuit breaker may have tripped, which is easy to fix. When you flip the breaker, if it trips immediately, call a professional to investigate further. If you think the heating elements are not working properly, call the heat pump pros at LIBERTYAIR. Servicing the heating elements should only be done by professionals. Air isn’t hot/cool enough.Heat pumps don’t work the same way as a traditional furnace or central heating unit. The heated and cooled air may not reach the same temperatures that a gas furnace or air conditioner can produce. If the air is noticeably cooler than usual, check the thermostat, ensure your registers are open, check the air filter (and replace if it’s dirty), and ensure the heating elements are working. If the heating elements are not working, or if the other steps do not improve the temperature of the air, call LIBERTYAIR. Condenser unit is frozen!If the heat pump’s condenser unit freezes, simply turn it off. Next, check for clogs in the filter or obstructions in the return­air registers. 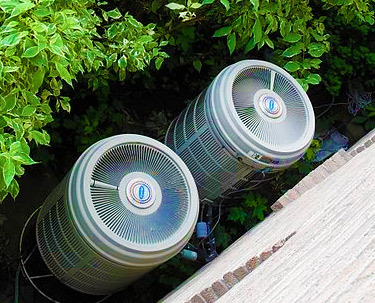 If you’re unable to find an issue with the airflow, it’s time to call a professional.